I'm very happy it's Friday, even though I have to come into the office for a few hours tomorrow. I have been so busy this week, both during the day and after work, that I feel like I've barely seen Chapin and George. The collar reminds me of the Elizabethan age, which then reminds me of the dramatic interpretation piece that Katie and I performed in high school: Mary, Queen of Scots. Katie played Queen Elizabeth, and I was the horrid Mary. We performed it at competitions throughout the '94-'95 school year and won first place and other trophies! We even performed it at our school's own Renaissance/ Shakespeare drama production. My mom made our costumes. We both had dinner last night with our former high school newspaper teacher, Mrs. Umeck. It was so fun to catch up and be reminded of memories like this one. I have seen Katie twice this week for dinner, and she is about to give birth to her second child, so I know I won't be seeing her that much in quite awhile. 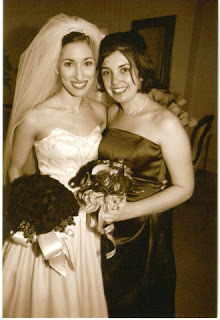 It's amazing to me that we have known each other for almost twenty years. The shoes I'm wearing also have a good story. They are the shoes I originally bought for my sister-in-law, Stacey, for Christmas. Since they didn't fit, I decided to keep them, and a pair in a larger size is on its way to her right now. The shoes, Tory Burch's famed leather Reva Ballerina Flats, are quite in demand, and you won't find them on sale anywhere. That's why, when faced with this dilemma, you can at least choose an online store like ShopBop.com where you won't be charged shipping or sales tax.